Going with your dog’s natural instincts is the key to successful housetraining. Canines are naturally clean animals. If they can avoid it, they would rather not dirty themselves and their eating and sleeping areas. They also develop habits of where they like to eliminate. For example, a dog that prefers to do his business on grass or dirt would rather not do it on gravel or concrete. Once you know your dog’s natural tendencies, you can use them to speed up the toilet training process. There are two things you can do to succeed in housebreaking. First, establish your dog’s den or living area in a small, restricted space like the bathroom or part of the kitchen. Note: the den is not a crate. Try to spend as much time as you can with your dog in his den. It is important to feed and play with him in this area. This is also where he should sleep. Give your dog his own bed, which can be a blanket, beach towel, or open crate. Your pet may eliminate here at first, but once he realizes that this is his special den, he will avoid making a mess in it. When your dog becomes used to sleeping in his bed, you can move it around the house wherever you go. Confine your pet to his bed whenever you are in an area that is not his den. If it’s a crate, simply close the door. If it’s a blanket or towel, place it next to a piece of furniture and put a leash on your dog so he can’t get out. 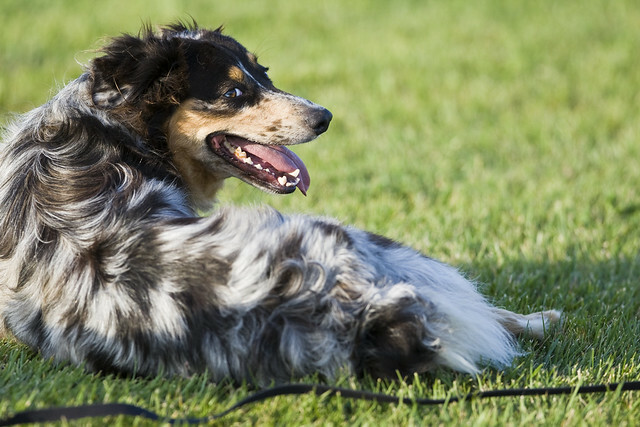 You should never leave your pet unattended while leashed, so it’s a good idea to leash him to yourself by tying one end to your belt loop or around your waist. This way, your dog can accompany you around your home and you can supervise him. Next is establishing your dog’s bathroom. See to it that he always has easy access to this area. It is crucial that you accompany him here every time until he is potty trained. Put your dog on a regular feeding schedule to make things easier for the both of you. Remember, what goes in on time will come out on time. If you know when your pet needs to do his business, then you’ll know when you have to take him to his toilet area. While healthy adult canines can hold it in for up to 8 hours, you shouldn’t keep your dog without access to his toilet area for too long. If he can’t hold it in anymore, he will be forced to eliminate inside the house and it might become a habit that will impede his progress. Once your dog is consistently using his toilet area and not having accidents anymore, you can begin extending his den to other parts of the house. Give him access to one room at a time when you know that his bladder and bowels are totally empty and only when you can supervise him. If you can’t, then either confine him to his bed in that room or place him back in his den. Give your dog a reward every single time he eliminates in his toilet area to accelerate the housetraining process. It is also important to not punish him when he has an accident, as doing so will only confuse your pet and delay his progress.